The late Michael Sedgwick, a renowned motoring historian with a flair for deadpan wit, opined that the Fiat 500 was 'the best baby car to be conceived between the Austin 7 of 1922 and the Renault 4cv of 1948'. Development of the 500, soon more familiar as the 'Topolino' (this name being Italian for 'Mickey Mouse'), started in 1935 at a time when Italy's economy was somewhat fragile. Involved on the project alongside Fiat's revered chief designer, Dante Giacosa was Fessia who later engineered the Lancia Flavia. Entering production the following year the 500 was an immediate success, 112,000 being made before the first major redesign took place in 1948. The pretty cabriolet body was initially the sole option, and combined proper doors and fixed roof rails with a roll-back canvas top - greatly enhancing its appeal. Like the Mini the Fiat 500's internal cabin space belied its external dimensions, a feat achieved by placing the engine ahead of the front wheels' axis, with the radiator behind the engine (where it doubled as the interior heater). The wheelbase was only 6ft 7ins, but 15-inch wheels resulted in excellent visual proportions. The 52 x 67mm (569cc) four-cylinder sidevalve unit had an aluminium cylinder head and developed 13bhp! Yet this modest power output, allied to a 4-speed all-synchromesh gearbox and the car's low weight still was sufficient to deliver 55mph and a fuel consumption of 45-50 mpg. Other advanced features included independent front suspension and 12-volt electrics. 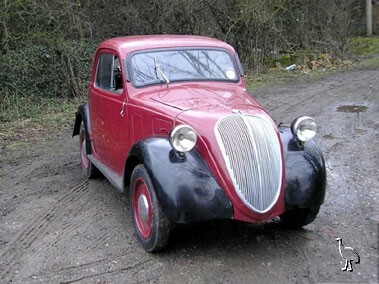 In 1938, the 500 sold in the UK for £120, when the cheapest Austin 7 version was £112 and a far more primitive design. Finished in black over red with tan upholstery, this particular example is described by the vendor as being in "good" condition with regard to its engine, gearbox, electrical equipment, interior trim and bodywork, while he rates the paintwork as "good in most areas except for some flaking to the doors".